Animals Should Definitely NOT Wear Clothing by Judi Barrett, illustrated by Ron Barrett (Atheneum Books for Young Readers, 1970). This story is short and extremely silly; it's great for a broad range of ages. 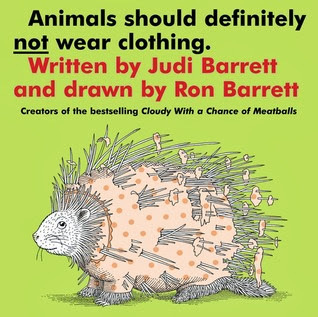 The Barretts examine many different reasons animals should not wear clothing - it would be disastrous for a porcupine, a mouse would get lost in it, it would be messy for a pig. Each spread features an amusing illustration - my kids are particular fans of the hen. The illustrations definitely make this book, so it'll work best if everyone has a good view. 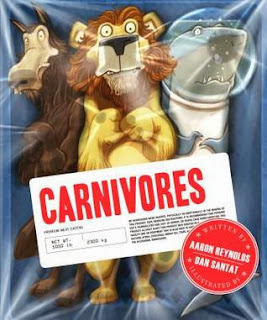 Carnivores by Aaron Reynolds, illustrated by Dan Santat (Chronicle Books, 2013). I totally flubbed this book when I read it to my first group because I didn't practice it beforehand. I had read it, thought it was really funny, and stuck it on the Afterschool shelf. When I picked it up a couple of weeks later, I made a big mistake by bringing it along without practicing the readaloud! When I did it for my second group (after practicing! ), it went a lot better and the kids enjoyed it. This is a good choice if you have older kids; I think a lot of the humor went over the heads of the younger kids in my groups. I introduced the story by asking if someone could tell me what a carnivore is and we talked a little bit about that before I read the story. 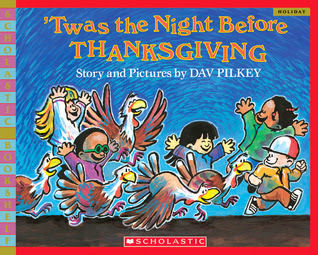 'Twas the Night Before Thanksgiving by Dav Pilkey (Scholastic, 1990). This rhyming story is a little silly with a lot of heart and it's perfect for the school-age crowd around this time of year. In the cadence of "Twas the Night Before Christmas", Pilkey spins the story of a class visiting a turkey farm on a field trip, realizing what's going to happen to their new turkey friends, and smuggling the turkeys out under their jackets to enjoy a veggie Thanksgiving dinner at their houses. This month's craft was a paper mosaic leaf and we debuted our new glue sponges! These have been all over Pinterest for elementary school classrooms and they're great for libraries, too. We've replaced the glue sticks at our make-and-take craft table and we've started bringing the glue sponges along to our Afterschool outreach. They last way longer and are way less messy than glue sticks (or glue bottles) and the kids got the hang of them quite quickly.